We’d love your help. Let us know what’s wrong with this preview of It's Not Easy Being a Superhero by Kelli Call. To ask other readers questions about It's Not Easy Being a Superhero, please sign up. I'm so grateful for this book! From infancy we knew there was something "different" about my daughter. The older she got the more apparent it became that she had some unique struggles and strengths to deal with. When a friend told me about Sensory Processing Disorder and started researching like crazy. My daughter has not been officially diagnosed, but what I learned about SPD just fit so much of what we saw in her. Learning about SPD gave us many tools to help her. So imagine my excitement when I'm so grateful for this book! So imagine my excitement when I heard about a picture book for kids all about SPD. As a mother and a former school teacher I knew the value of presenting this information in a format that would make sense to kids struggling with SPD and to the children and adults in their lives. So the day the book came I gathered my 4 kids, ages 4-11, and we read it together. All 4 of them were caught up in the ups and downs of the superhero's powers, and in the illustrations that brought it all to life with exciting colors, movement, and a bit of a classic superhero comic book feel. When we'd finished reading I asked my kids if they felt like they could relate to Clark at all, or if they knew someone from church or school who maybe reminded them of Clark. I was fascinated that they all could say they related to Clark and having triggers that just set certain feelings or behaviors off. We talked about what things they do now and could do better, just like Clark, to help keep our reactions in check and to calm us down. All 3 of my school age children told me about kids they knew in their current class or in previous classes that they thought had super senses just like Clark, and they felt that the book helped them understand better why they acted in certain ways at times. And it didn't seem so weird anymore. And My 11 year old, who actually displays SPD behaviors, didn't stick around too long after we finished discussing. I imagine she felt she was "too old" for picture books, but I loved watching my 7 and 4 year old look through the book again together. When it was time for bed my 7 year old took the book with her. I saw her reading it again in bed. The next morning when I went in to her room she was already awake reading the book again. I got to thinking about what about it spoke to her in particular. She hasn't ever seemed to have symptoms of SPD; but she is independent to the extreme. She tends to react suddenly and strongly with her emotions in unpleasant situations, and sometimes even her positive reactions are overly strong. We are always working on self-regulation of her emotions, and it struck me that Clark's sensory superpowers might feel similar to her lack of emotional control. I was inspired to take a new, more positive, approach to her unique struggles; to see her as a future superhero in training, with a lot of strength to offer the world. I'll say it again - I am so grateful for this book and the positive discussion it inspired in my family. And for the perspective we all gained. It would be an amazing tool in any classroom or family to help understand the strengths and weaknesses involved in SPD and in all of us. It's so relatable and understandable. And so positive in a world where we all have hard things, but doing them is what makes us super. An empowering story for children with Sensory Processing Disorder. My first thought upon opening this book was "WOW!" The pictures are absolutely beautiful! The colors are rich, and the main character, Clark, is a realistic looking child. This makes it fun for children young and old to look at. Once I read the story, I was very impressed. The author, Kelli Call, obviously has spent a lot of time researching Sensory Processing Disorder, or SPD. It is also apparent that she has a great understanding of the needs of children. The story is narrated by Clark, who is My first thought upon opening this book was "WOW!" The pictures are absolutely beautiful! The colors are rich, and the main character, Clark, is a realistic looking child. This makes it fun for children young and old to look at. Once I read the story, I was very impressed. The author, Kelli Call, obviously has spent a lot of time researching Sensory Processing Disorder, or SPD. It is also apparent that she has a great understanding of the needs of children. The story is narrated by Clark, who is a young child. He is able to discuss his SPD in a way that turns the challenges into strengths. It is easy for children to relate to Clark. Children will feel a sense of empowerment after reading this book. Additionally, I love how Mrs. Call incorporates the "helpers" in Clark's world. Children who have SPD may attend many different therapies, and may have various specialists in their lives. These individuals are known as Clark's "sidekicks". He explains how they help him. Children will relate with the techniques that Clark uses to help control his "powers"--swinging, joint compressions, darkness, etc. Whether or not your child has SPD, this book is a must-read! Sensory Processing Disorder (which affects up to 16% of children) is often looked at as a weakness, but Clark turns his SPD into his superpowers! My 4-year-old has asked to read this over and over. Beautiful illustrations, engaging writing, and a message that definitely matters. 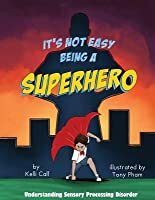 My kids and I enjoyed this story about a boy who has "superpowers" which help him concentrate or react to things or others in an appropriate way when his super sensitivity otherwise makes it difficult to do so. If you have a child that falls on the autism spectrum, this book might help. Wonderfully illustrated as well. I love the fun way the author uses superpowers to explain what it is like for a child with sensory disorder. The illustrations are amazing and really capture the image the author is trying to portray. Such a wonderful book! Great art. Very informative. Everyone needs to be know about SPD. 1 in 20 kids have it and most parents have never heard of it. My wife and some of my kids have this disorder. I'm so glad to see a book that informs parents (and kids) about it. This was well written and I loved the cartoony art.